Here are some examples of work we have produced and are currently involved in. We strive to provide our clients with the best quality work at the most efficient rates. We have a team of highly skilled and qualified archaeologists, heritage consultants and researchers who can manage your project effectively, be it big or small. 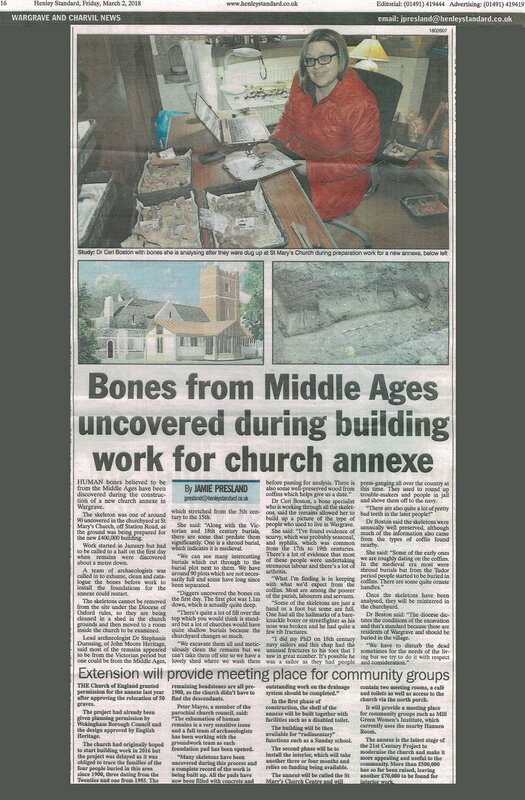 Check out this article published in the Henley Standard last week about one of our sites in Berkshire. The site has produced evidence of over 90 individuals and associated artefacts dating to the earliest use of the area by the church. It is a very important assemblage for gaining insight into the history of Wargrave and the people who have historically resided there. Though many of the surviving, articulated burials were later than 17th century, there is a great deal of evidence of older burials and some which could date to the medieval period - or possibly even earlier. It should be noted that more than one of the burials are thought to pre-date the 18th century. Above: Printed article clipping from the Henley Standard, 2 March 2018.